Undoubtedly the sea is one of the principal attractions, and even if there are a few beaches, this fact will not change your idea about laying, and enjoying a pristine sea. 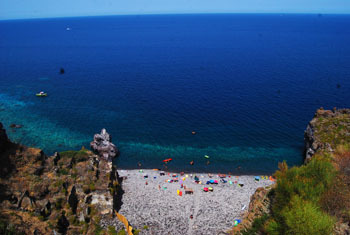 In the Legambiente and Touring Club classifications, published by the Guida Blu 2014, the island of Salina is collocated at the second national place concerning the most beautiful beaches as a landscape, and for all the activities of environmental safeguard. Situated in the commune of Malfa, the beach of Scario is only 5 minutes away from the residential centre on foot. It is a beach composed of pebbles and smoothen stones, immersed into the rich nature, framed by crystalline water. The beach is an ideal place where to swim without great efforts, because of its peculiar conformation, which helps an entrance into the sea. The Scario, beyond its environmental and landscape value, assumes important historical connotations, as it once was the slipway of sailing ships which crossed the seas between Sicily and Campania. 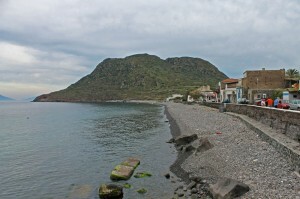 Situated on the north-western side of the island, next to the namesake village of the commune of Malfa, the beach extends under a steep cliff shaped as an amphitheatre, characterized by a shoreline of dark stones and gravel, is one of the most charming places of the Aeolians; at north there is “Balate” Bay, shaped by Perciato, a mount where you can see stores and shelters excavated from tuff; you can arrive to the creek through a steep staircase, crossing what is now called the house of the Postman, where the namesake film was set. The water is clear and crystalline, you will find yourself swimming in a collapsed prehistoric crater, whose ruins, shaped by fire, wind and sea, are yet visible. From this beach it is possible to admire the spectacular sunset, considered one of the most beautiful sunsets in the world. The sun, of a wonderful intense red colour, acts as a setting for amazing natural attractions. The beach is reachable through a steep path, and is circa 30 minutes away from the residential centre of Pollara. 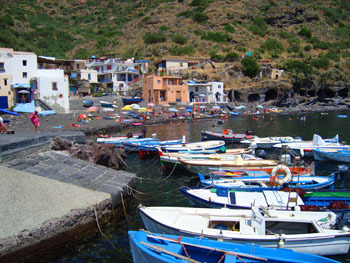 Situated in the namesake Rinella fraction , in commune of Leni, it is a small beach of black sand, of a half-moon form, surmounted by caves excavated in the rock, once used as shelter for the boats. 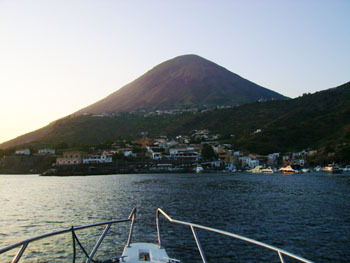 The low and sandy depths are a real paradise for the funs of snorkelling, who beyond the marine flora and fauna can observe the volcanic activity, consisting in phenomena called sconcassi (upheavals), which are manifested with gas emanation and vapours from depths. Located next to the principal port, and the residential centre of the island, it is a wide shore with big smoothen stones, upon a particularly clear cobalt blue sea. Between the wide range of activities, you should not lose the island tour by boat, the best way to admire the sea, the beaches, the bizarre rocky formations, and residential centres, with their typical white houses, characteristic of the zone. If you do not have any boat, you can hire it or book an excursion; there are a lot of agencies which offer this kind of service. Moving from Santa Marina in the northern direction, once passed the charming village, you find yourself at Cacato Reef, where you can observe the volcanic origin of this immense bay with particularly clear and crystalline waters. 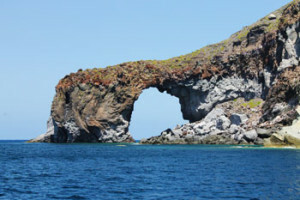 The next stop is Capo Faro, characterized by a high reef surrounded by towering cliffs, and surmounted by a lighthouse, where the most fearless can go through the steep mule track. Moving in the same direction, you will find the port Scario Galera, surmounted by a peculiar commune of Malfa, where you then arrive. 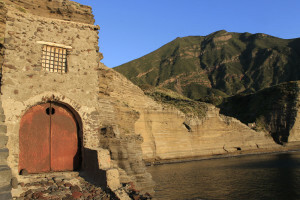 In Punta Perciato, where you will be welcomed by a suggestive arch of volcanic rock, shaped by sea and wind, which opens the view upon the amazing Pollara Bay, situated upon the remains of a collapsed crater; an extraordinary succession of small creeps, perpendicular walls, caves mounted in lava, enclosed on the North by Perciato, an unusual mount full of the shelters excavated in tuff, and dominated by the stack of Pollara. Like a castle, in the middle of the sea, it ergs as a protection of the one of the most beautiful bays of the archipelago, a real paradise for the fans of snorkelling. The Pollara Bay is enclosed by Filo di Branda on the south, a mighty rock upon the reddish sea. Once passed the Racina caves, Levi starts emerging , situated upon an upland of around 200 metres high, till you arrive to the picturesque fraction of Rinella, a small fishers’ village, where the unique sandy beach of the island is situated, surmounted by the caves excavated into the rocks, once used as shelters for boats. 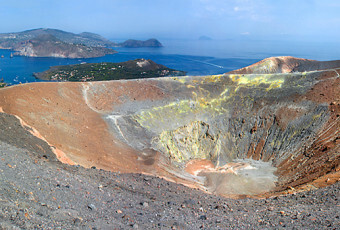 On the low and sandy depths, beyond the marine flora and fauna you can observe the volcanic activity, consisting in phenomena called sconcassi (upheavals), which are manifested with gas emanation and vapours from depths. The tour goes on along the slopes of the massive Fossa delle Felci, till you reach Punta Lingua, where to admire the salty lake, the lighthouse which surmounts it, and small houses which sinuously create a contrast with the environment. The last piece of the coast, passing through the Canne and Pozzo d’Agnello beaches, till the Santa Marina port, is flat.